Several people asked about the special peal that we rang on 9th May. Unlike the one rung last November for All Saints day, this one marked something that happened in another church, half a century ago. I learnt to ring as a teenager at St Wilfrid’s in what was then a small mining town in Nottinghamshire, called Kirkby-in-Ashfield. We only had five bells then (though I had the privilege of ringing in the first peal on the eight when they were augmented in 2001). Another boy, Martin Kirk, learnt a few months before I and my late brother Andrew did. The three of us were extremely keen, and spent much of our time ringing (we were also in the Scouts and the Choir but there wasn’t a lot else to do). Between us we trained many more ringers, and were largely responsible for the upsurge of ringing at Kirkby during the early 1960s. We then went our separate ways. Martin now lives in North Yorkshire, and decided to mark 50 years as a ringer by ringing a peal – not in one of the standard methods, but a new one named Kirkby-in-Ashfield Surprise Major. I decided to do the same here at All Saints to mark my 50 years. I gathered a band of current and former Wokingham ringers, as well as people I rang with at Cambridge University and at Kirkby (Martin travelled down from Yorkshire to take part). Nigel Herriott, who was Tower Foreman at All Saints in the early 1990s, called the peal, using a musical composition by Don Morrison, a prolific North American peal composer. 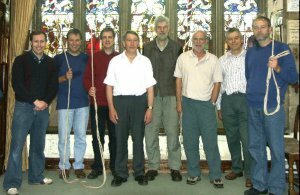 The band (L-R): Chris Cole, Jon Tutcher, Nigel Mellor, Ken Davenport, John Harrison, Martin Kirk, Ken Darvill, Nigel Herriott. The picture of St Wilfrids was taken nearly 50 years ago.